Number of Pairs: up to 100 Pairs. Conductor Diameter: As per Customer requirements. 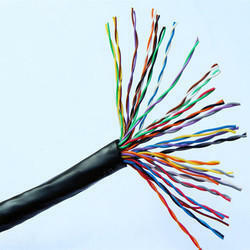 By leveraging our extensive market knowledge, we provide the best array of Telecommunication Cable. - Insulation: Colored PVC Insulation. - Twisting: Two insulated wires are twisted to form pair. - Stranding ub unit 10 pairs (binder with colored identification tape). Supported ourselves with proficient amenities, we are readily instrumental in providing an inclusive variety of Telephone Switchboard Cable. Effective communication plays a vital role in the economic growth of any country. Keeping this in mind, FINOLEX is the pioneer Indian company to enter the telecommunication field by manufacturing polyethylene insulated Jelly Filled Telephone Cables (PIJF), that meet exacting standards of the Indian Telephone Department. Application: Indoor installation for the interconnection or telephone, electronic equipments. Conductor: Copper-Solid Bare or Tinned, 0.4, 0.5, 0.63, 0.71 & 0.9 mm up to 100 pairs. Our organization is highly appreciated by the clients for manufacturing, supplying, wholesaling and exporting a wide range of Twisted Pair Telephone Cables. These cables are manufactured as per the set standards by utilizing superior quality raw material and highly advanced machines & tools.